In their Tenth Anniversary season, the Albany Dutchmen completed another successful campaign, calling Connors Park at Siena College home for the second year. It was the seventh consecutive season in which the Dutchmen eclipsed the 20-win mark as they achieved their fourth consecutive playoff appearance. 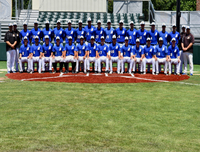 Highlighted by players from programs such as Louisville, Wake Forest, Vanderbilt, Ole Miss and many more, the Dutchmen finished second in the East Division, with the third best overall record in the Perfect Game Collegiate Baseball League (PGCBL) of 26-17. The Dutchmen won six out of their first eight games of the season, but a four-game losing streak at the end of June made them unable to separate themselves from the pack in the East. Over a three-day span from July 6th-8th, Albany played three consecutive doubleheaders and finished 5-1, including a sweep of the Amsterdam Mohawks on July 8th, winning by a combined score of 21-11. Following the All-Star break, the Dutchmen won eight of their final 11 games to earn the second playoff spot out of the East. In their home season finale on July 29th, a 7-5 victory over the Saugerties Stallions was the clincher that sent Albany to the postseason. The season came to an end on August 1st in Amsterdam in the PGCBL Quarter-Final Round, with a dramatic 9-8 walk-off loss to the Mohawks. Down by seven runs after two innings, the Dutchmen stormed back with eight unanswered runs and held the lead through five innings, a mark of resiliency displayed throughout the season by the team, despite ultimately falling to the eventual league runner-up. As a team, the Dutchmen were second in the league in team ERA (4.25), had the third-best home record (14-6), went a perfect 16-0 when leading after eight innings, and had the league’s third highest total with 110 total stolen bases. In game one of a doubleheader on July 7th against the Oneonta Outlaws, the Dutchmen earned a 2-1 win to earn Head Coach Nick Davey’s 200th career victory. He is the second Head Coach in Dutchmen history and has been at the helm for the past nine seasons. Since the franchise joined the PGCBL in 2011, Davey has led the club to a regular season record of 197-178 (.525). The Dutchmen had six players, more than any team on the East team, and two coaches attend the PGCBL All-Star Game in Elmira on July 18th. Pitchers Deaven Phillips (Tampa), Ryan Greco (Brockport), outfielder Ubaldo Lopez (Dartmouth), catcher Jerry Huntzinger (Seton Hall), infielder Cameron Masterman (Louisville), as well as the starting second basemen for the East Lucas Dunn (Louisville) represented Albany in the Mid-Summer Classic. Dutchmen Assistant Coaches Sean Buchanan managed the East squad, while first year Assistant Coach and 2017 Dutchmen Player of the Year, Brandt Holland, joined the staff for the East. The 2018 MLB First-Year Player Drafts saw four former Albany Dutchmen players drafted by Major League teams. Troy Montemayor (25th round, St. Louis Cardinals), Sean Boyle (25th round, New York Yankees), Justin Childers (Detroit Tigers), and Ted Cillis (33rd round, Kansas City Royals) were all selected. Montemayor dominated with a .52 ERA in 17 innings pitched in 2016. Boyle went 3-2 for the Dutchmen in 2017 and recorded 21 strikeouts in 22.1 innings pitched. Childers was a two-year member of the Dutchmen (2016-17) and collected 60 RBI and scored 49 runs. On June 12th at Utica, Golston Gillespie (Ole Miss) went 4-for-6 and hit two two-run home runs in consecutive at bats in the eighth and ninth innings, in the Dutchmen’s 11-2 rout over the Utica Blue Sox. He also added a stolen base in the contest, one of six for the Dutchmen, who were active on the basepaths all season. Masterman led the team with a .357 batting average, 45 hits, 27 RBI, and a .442 on base percentage. In seven games from July 7th through the 21st, Masterman had six multi-hit games, including a streak of four in a row and hit .520 over the span. At Oneonta on June 20th, Cameron went 4-for-5 with two-RBI, two runs, and a stolen base in the Dutchmen’s dramatic 16-14 comeback victory over the Outlaws. On the bases, Masterman was a perfect 9-for-9 in stolen base attempts. In his second season with the Dutchmen, Phillips was 4-1 in seven starts. He was second in the PGCBL, among qualified pitchers, with a 1.89 Earned Run Average. In 38 innings pitched, he struck out 23 hitters and allowed just 33 hits. On June 19th at Glens Falls, Deaven pitched six and a third shutout innings and allowed just one hit in the Dutchmen’s 3-2 win over the Dragons. He gave up no more than two earned runs in each of his starts, and opponents hit just .241 against him overall. Phillips earned the start in the PGCBL Quarter-Finals at Amsterdam, where the Dutchmen fell to the Mohawks, 9-8, despite overcoming a seven-run deficit. For the fourth year in a row, the Dutchmen took part in the Tri-City ValleyCats’ pre-season exhibition game with several thousand school-aged children in attendance for a 10:00 am showcase at Joseph L. Bruno Stadium in Troy, New York. Attempting to defend their victory in 2017, the Dutchmen fell 6-1 to the pros, despite bringing the tying run to the plate in the fifth, sixth, and seventh innings. In what has been a staple of the organization over its ten years in existence, the Dutchmen have taken pride in giving back to the community. One of the biggest examples of the organization giving back came in the eighth annual installment of the Dutchmen Pink Game. The event included a Raffle, Game Worn Pink Jersey Auction, and a 50/50 Raffle with all the proceeds donated to the American Cancer Society and Susan G. Komen Upstate NY. In addition, every Dutchmen player made their presence felt, lending a helping hand at various events around the capital region. Some events that the team took part in included the New York State Special Olympics, the Annual North Colonie Challengers Picnic, the 2018 Strides 4 Stride Run-Walk n’ Roll, Halfmoon Softball Clinic, Chatham Baseball Clinic. Also, players made visits to area elementary schools for readings. In addition, the Dutchmen hosted several CDTA Come Play Clinics, in which youth baseball and softball players were given the opportunity of free instruction by Dutchmen players and coaches at Connors Park. Lastly, at every home game, the Dutchmen offered the Bone & Joint Center Baseball Buddies programs to teams in the area. Not only were Baseball Buddies supplied complementary admission, they were given the chance to play catch on the field with Dutchmen players, converse, get autographs, and run on the field with the starters. The event consistently led to nights both the Baseball Buddies and the Dutchmen players will always remember.